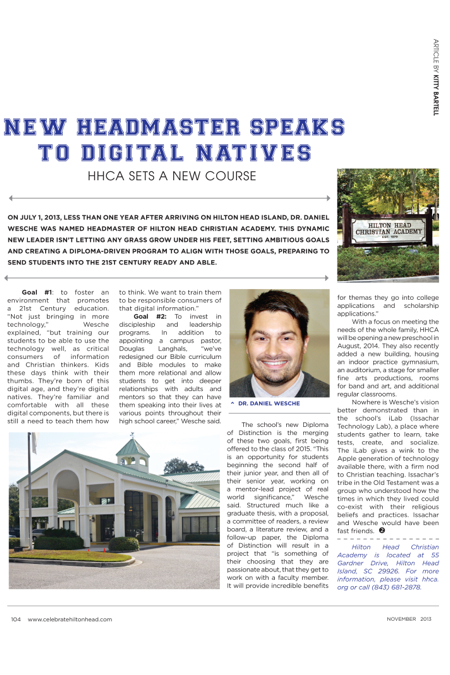 On July 1, 2013, less than one year after arriving on Hilton Head Island, Dr. Daniel Wesche was named headmaster of Hilton Head Christian Academy. This dynamic new leader isn’t letting any grass grow under his feet, setting ambitious goals and creating a diploma-driven program to align with those goals, preparing to send students into the 21st Century ready and able. Goal #2: To invest in discipleship and leadership programs. In addition to appointing a campus pastor, Douglas Langhals, “we’ve redesigned our Bible curriculum and Bible modules to make them more relational and allow students to get into deeper relationships with adults and mentors so that they can have them speaking into their lives at various points throughout their high school career,” Wesche said. With a focus on meeting the needs of the whole family, HHCA will be opening a new preschool in August, 2014. They also recently added a new building, housing an indoor practice gymnasium, an auditorium, a stage for smaller fine arts productions, rooms for band and art, and additional regular classrooms. Hilton Head Christian Academy is located at 55 Gardner Drive, Hilton Head Island, SC 29926. For more information, please visit hhca.org or call (843) 681-2878.